Thinking of a mobile app specially designed for the enterprises only brings the feeling of a smooth passage which has the every possible ingredient in the mobile app to make it a worth to use for the mobile app. This is the thought process of a user who expects a seamless experience in the enterprise mobile app usage, but from the development perspective, an enterprise mobile app can be challenging and demanding due to the high number of data and security as a top-most priority in the enterprise mobile app. An enterprise mobile app, indeed is a great idea for any company to ease down the troubles and pains of their users, while accessing the official information and it also boosts the productivity feature, but the major issue comes, when you have to pick a right mobile app development company for your app requirements…Thinking why am I even mentioning this? 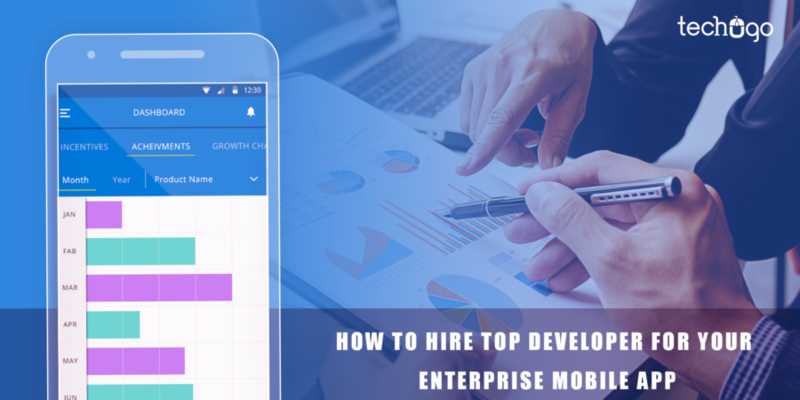 Then the reason behind this states that every Enterprise mobile app consists of designing and integrating the enterprise backend within the enterprise app, requires the expertise of higher level, and you cannot expect any random company in the app development field to cater the services of enterprise mobile app to you. Unfortunately most of the mobile app development companies existing in the app development field hold the name but not the exposure, it might sound so grumpy, but this is the bitter fact of the mobile app development field, which states that not every mobile app has the expertise and the exposure to handling the different app requirements, so your first task needs to be picking the app development company, depending on the exposure of the app development company, but the question arises, how to detect the exposure of an app development company? For this, you need to check the app development company’s app delivering history, which states that which all types of mobile app, it has delivered, and what had been the success rate/reviews/ and the download rate of those mobile apps. You need to pick a mobile app development company on the basis of its variety of apps delivered, so you shall have a very clear understanding that how the proposed mobile app development company has catered the app solutions to different industry verticals. It is a human nature that we always look for the number of views and opinions before picking any new service, and it really helps, but why not to pick these reviews and opinions from a trusted resource? Yes you heard me right, when you decide to pick a right mobile app development company for your enterprise app requirements, then you must look in for the best reviews and the suggestions, hailing directly from the trusted and reliable sources of Listing websites, such as Clutch, AppFutura, GoodFirms, Skilled and many others. These listing websites hold the best reviews and the opinions from the direct clients, and these reviews are completely unbiased, which gives you a more sheer and clear understanding of the mobile app requirements. If you are finding this a little chaotic and confusing then you must understand that by stating the app development partner, I clearly means that every mobile app development company actually works for you but not every mobile app development company works WITH you, this clears the every possible confusion and misconception leading to the app failure, because your app development company when it starts to work with you, it finds out the best solution to reach your audience through the app technology, so you need to ensure the mobile app development company you have picked is a development partner and not just a mobile app development company to cater your needs. An enterprise mobile app can only be a successful product when your mobile app development partner fully understands your app requirement and is ready to deliver the enterprise app solution on the basis of your end users’ demand and is not just a mobile app, but actually, provides a solution to your users. This piece I have written on the basis of my personal experience, which has made me experienced some of the worst and some of the best enterprise mobile app solution, which made me realize that if you pick a wrong app development partner for your enterprise mobile app solution, then it only leads to some of the heart-wrenching consequences for your business requirements.